Whenever new face masks launch there is quite a buzz surrounding it, especially when it's affordable and from the drugstore. Recently Garnier launched three sheet masks (tissue masks) and people have been going crazy for it. 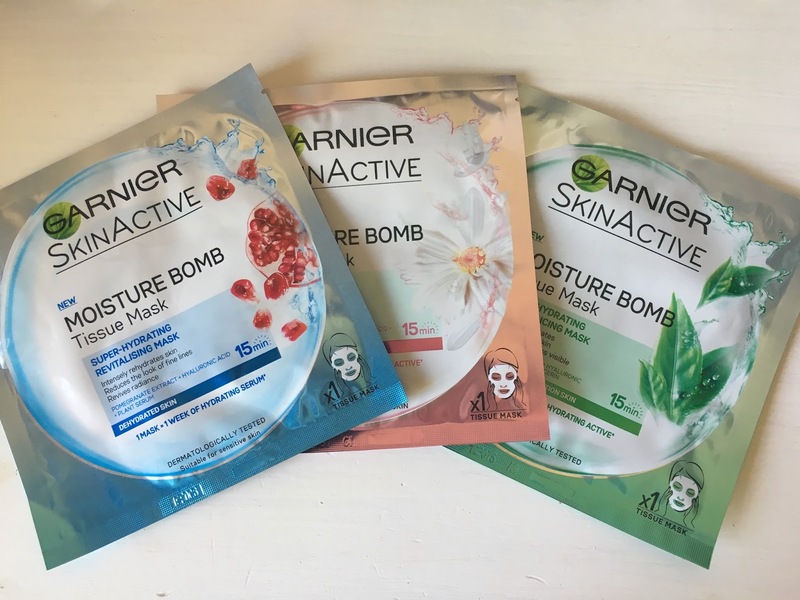 There are three variants in this "Moisture Bomb" range: Pomegranate Super-hydrating Revitalising mask for dehydrated skin (blue), Super-hydrating Rebalancing Mask for normal to combination skin (green), and Super-hydrating Soothing Mask for dry and sensitive skin (pink). The blue mask contains pomegranate, the green one green tea extract, and the pink one chamomile. The face masks each come with a gauze backing that you remove when applying it. The face masks are quite large and will fit any size face. My only gripe is that the holes for the eyes and the mouth are too small. There are little tears in the sheet mask that allow for stretching, but I find that these are not enough for me. My face is quite big and my features large, so I have to take a pair of scissors and make extra cuts at the outer corners of the eyes and the mouth. I've found that works and that cutting the parts next to the nose hole on each side also works. You're still left with a single sheet mask, but now the nose flap is only connected to the forehead part, if that makes sense. The masks are soft and drenched in moisture. There's nothing worse than just a damp face mask - it needs to be almost soaking wet. That being said, there's no moisture dripping off the mask, everything stays put. The instructions say to leave the masks on for 15 minutes, but I usually leave it on for 30-45 minutes. At about 45 minutes I can feel the mask getting slightly drier and that to me is the sign that it's time to remove it. You can, however, leave it on for even longer, but I wouldn't ever sleep with a sheet mask on. Can you imagine waking up in the middle of the night with a sheet mask that moved and is busy suffocating you?? I don't feel a big difference between the three face mask variants, but I do really like all three. All three leave my skin feeling incredibly juicy and plumped up. My skin feels soft and hydrated and anything I put on top of it (like a facial oil or moisturiser) glides right on. At between R49.95 and R54.95 each they aren't the cheapest sheet masks (both the Skin Republic and Sorbet masks are cheaper), but I still think they're great value for money. I bought mine from Foschini when they had a 3-for-2 offer on all Garnier face products, and I see my local Clicks and Dishem now also stock them. These stores also regularly have 3-for-2 promotions on Garnier products, so then it'll work out roughly R33.30 each which is an absolute bargain. Have you ever tried these masks? What do you think? Let me know in the comment section. These masks are amazing! I get the most out of them by keeping the sachet after I've tossed the mask itself. There is so much serum in there that I can get up to 3 more uses out of it, and slather the hydrating serum all over my face morning and night until it's completely finished. Oh wow, that's a lot! I have thought about purchasing a stack of dry face mask sheets and rehydrating them with my own concoction, but I haven't thought of what the concoction would be. This seems like the ideal way to use them! Thanks for commenting.